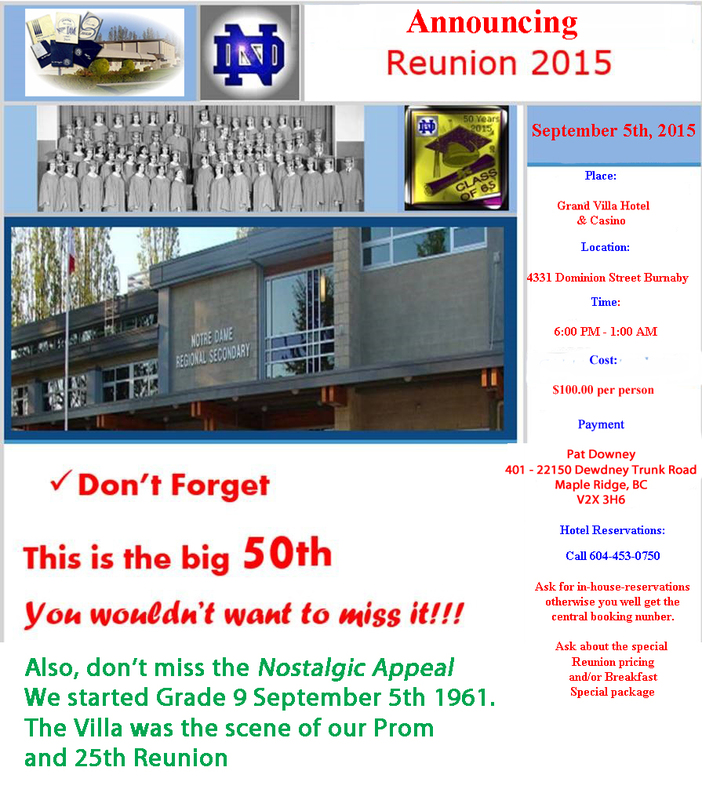 The class of 1995 is holding their 20 year reunion on Saturday, November 21st at 7pm at the Narrows Public House. You are invited to attend the Notre Dame Regional Secondary Grand Opening events on September 28th. As you can see from the invitation (pdf), are a number of events throughout the day, but we suggest that you attend the evening event at 7:00 pm where there will be a school tour and refreshments. You are invited to come and celebrate with your classmates from the Notre Dame Graduating class of 1985! It may seem like yesterday when we were penning our goodbye’s in our yearbooks, but it has been an incredible 30 years since we left Notre Dame. It’s time to reconnect and have some fun! Price: $25.00 per person – includes one free beverage (wine or beer) and appetizers. There will be a full no-host bar all evening. RSVP: You will receive a formal email invitation shortly which will allow you to RSVP. The reunion is also extended to spouses of graduates. Please forward this invitation to any classmates for whom you have email addresses, as we may not have everyone’s up-to-date contact information. We are also working on putting together a slide show to help us reminisce. Please scan and email any high school or social photos you have to Lori Webber (nee Gazzola) at shoestringworkshops@shaw.ca by September 4th to ensure they are included. We hope to see you there. Stay tuned for RSVP information to follow shortly! The Spring 2015 newsletter is available for download here (PDF). A former teacher at Notre Dame, Sister Francis Xavier Walsh, passed away last September 21st, 2014. Any balance after expenses will be donated to the Notre Dame Building Fund. Contact Pat (Antonelli) Downey: patdowney@telus.net regarding details and payment ASAP.